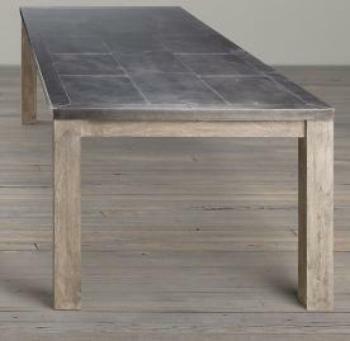 Restoration Hardware of Corte Madera, Calif. is recalling approximately 2,700 of its Railroad Tie & Parsons Railroad Tie dining tables after finding that the products contained lead that could be harmful to exposed children. The tables are either round or rectangular and have thin sheets of zinc/dark gray color metal on the table tops. The company received reports of elevated blood levels in four children in two homes where the recalled tables were present -- one involving two children in Rhode Island and one involving two children in Beverly Hills, Calif. The products were manufactured in India and sold at Restorationhardware.com between March 2012 and December 2016 for between $750 and $2,600. Consumers who own the tables are urged to immediately stop using them, cover them up, and place them out of the reach of children. The item number for each recalled item can be found on a white sticker located underneath the table top. The affected item numbers subject to recall include: 62430028ZINC, 62430018ZINC, 62430027ZINC, 62430016ZINC, 62430026ZINC, 62430029ZINC, 62430017ZINC, 62430030ZINC, 62430025ZINC, 62430024ZINC, 62430022ZINC, 62430032ZINC, 62430023ZINC, and 62430031ZINC. Consumers can contact Restoration Hardware to receive a replacement table or a full refund for their product. The company can be contacted Mon-Fri between 8 a.m. and 5 p.m.at its toll-free number 888-728-8419 or online at www.restorationhardware.com. Click the "Safety Recalls" link at the bottom of that page for more information.